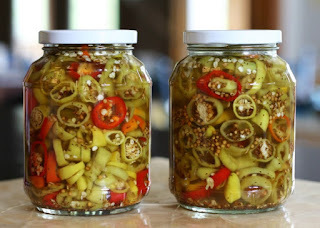 Here's a quick easy recipe for pickled sliced banana peppers, with no Sodium Benzoate. Bring to a boil, stirring in sugar and salt to dissolve. Remove from heat and add sliced peppers. Stir until peppers soften and should be mostly submerged in the liquid. Store in an airtight glass container, making sure peppers are covered with the liquid. They are great by themselves or on sandwiches. They stay fresh for about 2 months, but you will have eaten them by then! You can make your own pickles this way! Add the spices of your choice: dill, red pepper flakes etc.